"East Durham Junior High became the Holton Middle School at some point - my guess from a few clues is that the change occurred in the late 1970s or early 1980s. " I'm not sure when it changed, but it was Holton Junior High in 1962. Thanks Gary for the history/photos of East Durham Jr. High. I continue to be thrilled the school lives on as the Holton Career and Resource Center, a shining example of adaptive re-use as you said. I'd like to think the spirits of several generations still live within that structure as well as the wonderful teachers and admininistrators who guided those kids toward adulthood. Certainly a win for the preservationists and for those who now walk the halls that will always be special to many of us. Gary, this is a great article. I currently work there now. Do you know when the part past the auditorium was added on? If you would like a tour please feel free to let me know. Or the old media center? It was East Durham when I started 7th grade and Holland Holton Junior High School when I finished 9th grade in spring of 1961. This is when Edward Ulysses Hallford, Jr., was vice principal--Eddie Dennis the coach. The school, song I still remember: "On the city's eastern border, red against the sky, proudly stands our alma mater, as the years go by; onward ever be our watch word, conquer and prevail, hail to thee, our alma mater, East Durham, all hail!!!!" It was east Durham Jr. HS when I started 7th grade there, and I believe it was Holland Holton Jr. HS when I finished 9th grade in spring of '62. Eddie Dennis was coach, Edward Ulysses Hallford, Jr., was vice principal. The school song: "On the city's eastern border, red against the sky, proudly stands out alma mater, as the years go by; onward ever be out watch word, conquer and prevail, hail to thee our alma mater, East Durham, all hail!" Its funny the things one remembers when old--I can remember that song, but am not sure what I had for breakfast..
Mr. Hallford passed away in the mid-1970s and was probably still in his 30s when he died. I was in his World History class one summer. He was a fine man and a talented teacher. I well remember this school as I walked through Few Gardens housing project to get to the rear entrance from my house on Blacknall St.
We would all stand around smoking Tarreyton Ciggarettes before the bell rang to go inside. This must have been 1962 and although I had some good teachers, I have to say Captain Hester, as he was called, who taught math and science, was not one of my favorites. Giving only three questions on a test, if you missed one question, you failed the test. His personality and the rolling of the chaulk in his hands as he stood at the blackboard each day, caused the hair to stand up on my arms and back. Another jangled memory of a teacher was Kate G. Umstead, or whom we called, " Katie Hop" as she had a limp. She slapped LeRoy Lawson one day several times, then reached for me and I ducked her each time until she was out of breath. Funny thing, we were not doing anything wrong. And I can't leave out the wonderful Eddie Dennis, the coach who pulled out my thumb when Elmo Carden hit a line drive as I was casually walking across the field (not even playing the game). I fell to my knees when he pulled that bone half way back out. I never felt really comfortable with him as I was not into sports, which makes it extrememtly difficult to have fond memories of him. And then there was a group of beautiful girls who sat on the back row in one of the homeroom classes. One in particular always caught my eye and one day while waiting in line to go to the cafeteria, she yelled at me for staring. The humiliation was overwhelming, as I had to stand there in front of everyone and to this day, still feel that same awful feeling when I think of her. So many lessons learned in just three short years and two summers of summer school as I obviously could not pass with some of those teachers. Clem, Fred and me were always having fun though and I will always have fond memories of the good times there. If I could go back in the past, I would leave town on a fast train. Ok, so they fixed up old East Durham Jr. High, and they are still using old Durham High, but they tore down the old Hillside and Whitted Jr. High School is vacant and being that way for nearly 35 years. So when are they going to fix up old Whitted. In 1909 the Durham Traction Company built a baseball field on North Driver Street. Special streetcars would take people out the East Durham route - down E. Main to Angier, east on Angier to S. Driver, north on Driver to the ballpark. 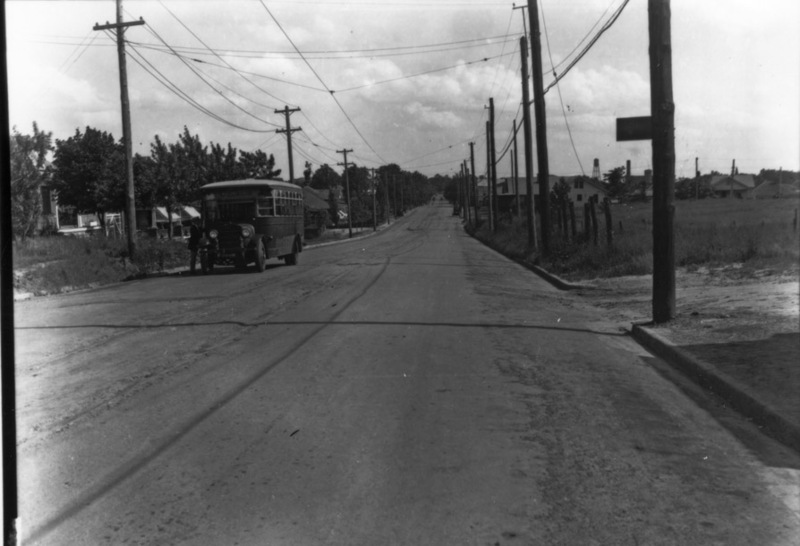 (The streetcar then continued north to Holloway, and west on Holloway to Mangum.) 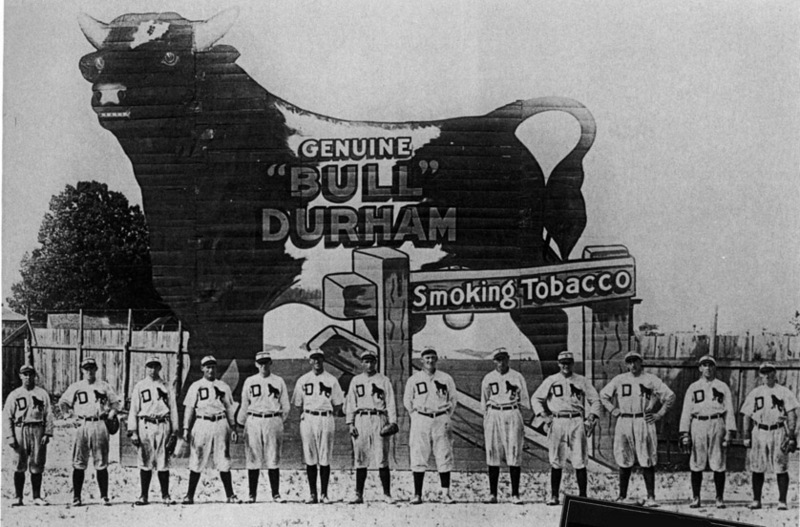 By 1910, a Durham city baseball league was established, with teams from the Durham Hosiery Mill No.1, the YMCA, East Durham, and West Durham. 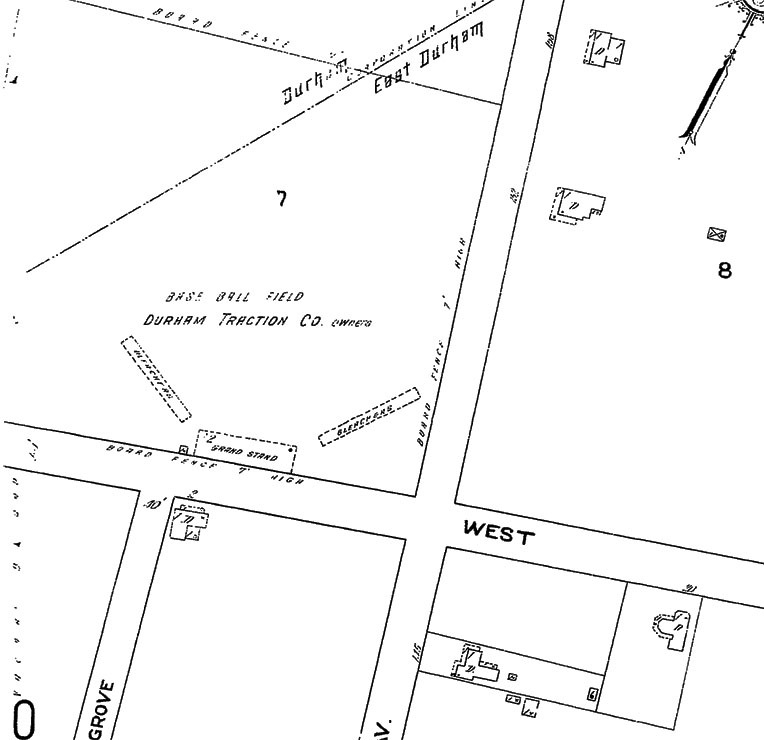 Sanborn Map of East Durham, showing the East Durham ballpark at N. Driver and West (now Taylor) Sts., 1913. 1920s photo, looking south on North Driver Street from near Southgate Street, with the overgrown edge of the ballpark site on the right. Looking southwest from North Driver Street, 1950s. The newer gymnasium is in the foreground, set back from the original facade. Bird's Eye view, looking northeast, 1950s. 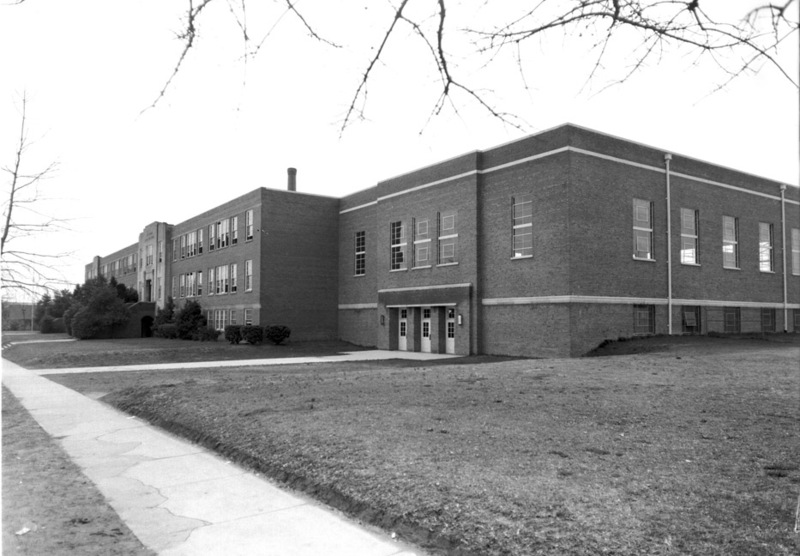 East Durham Junior High became the Holton Middle School at some point in the early 1960s, although it appears to have gone interchangeably by East Durham Junior High, Holton Junior High, and Holton Middle School for a number of years. It remained a middle school until 1992, when it closed after the city-county school merger. The Communities in Schools Academy operated out the the building until 2002. The future of the school building was uncertain at that point, but kudos to local government and Duke for having the vision to adaptively reuse the existing structure to create a community center that now anchors this end of Driver Street - as the baseball field once did. It was renovated beginning in July 2008 with completion in August 2009 through a partnership between the city, the county, Durham Public Schools, and Duke University Health System. The $16.7 million renovation rebranded the school as the "Holton Career and Resource Center," which includes a neighborhood clinic and 'wellness center'. The city's Parks and Recreation Department is housed on the second floor, and the Durham Public Schools houses vocational training programs in the building. Durham Parks and Rec also hosts after-school, summer camp, and other community programs in the building. The center opened in August 2009. All-in-all, this is a stupendous example of adaptive reuse - a model that the county could have followed for the Lowes Grove School as well. East Durham Junior High School. Art Moderne-style 2-story brick school that occupies the entire block along Driver St. between Taylor and Southgate streets on the sides and Maple St. on the rear. The original building consists of a 3-bay entrance pavilion with a stone facing, flanked by 8 bay brick elevations. The building rests on a raised basement. Brick is 1-to-5 common bond. The recessed entrance has a pilastered surround. The stepped entrance parapet is inscribed "East Durham Junior High School." Rows of triple windows, with flanking single windows, illuminate the clasrooms. These are replacement metal windows with transoms. About 1950, a 2-story auditorium addition was added on the south side. It closely follows the design of the original building, with a stone Art Moderne entrance bay. It retains 6-over-6 wood sash wndows. On the north side is a 1-story gymnasium addition of brick, with metal casement windows. The final addition is an International Style concrete and glass cafeteria, constructed to the rear about 1980. This striking addition is supported on concrete piers, with a heavy concrete framework enclosed with large galss bays. Until 1935 this was the Durham Baseball Park. 1940 CD:East Durham Jr Hi School. The school, still owned by the Durham School system, operated as the CIS Academy until it closed in the 1990s.